Steelers.com writer Bob Labriola reports that second-year tight end Xavier Grimble has earned a roster spot already, and him earning a spot in the starting lineup isn’t out of the question. With the departure of Ladarius Green, the Steelers will have to replace 36 percent of their TE receiving yards. Incumbent starter Jesse James had the lowest yards per route run figure by a TE on the team (0.88) but accounted for 40 percent of the team’s TE receiving yardage. 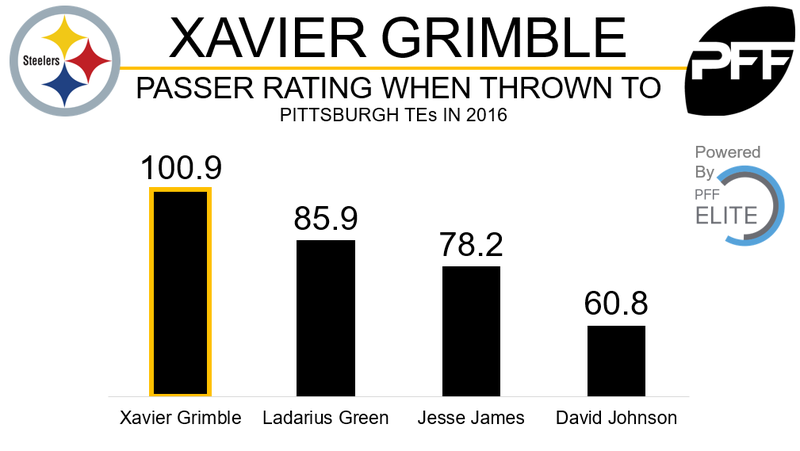 Grimble’s threat percentage of 15 percent (the percentage of time a receiver is targeted when there is an aimed pass while that receiver is on the field) in 2016 will lead the team going into next season among TEs.